Ghanaian international midfielder Derek Boateng has started a trial at Plymouth Argyle. The talented 21-year-old, a former African young player of the year, is currently with Swedish side AIK Solna. Boateng was previously at top Greek club Panathinaikos, for whom he played in the UEFA Champions League as a teenager. AIK Solna were surprisingly relegated from the Swedish First Division at the end of their season in October and they are now having to cut costs by releasing their best players, including Boateng. The attacking midfielder is keen on a move to England and he had a trial with Argyle's Championship rivals Wigan Athletic last week. Barclays Premiership clubs Crystal Palace and Middlesbrough are also thought to be interested in Boateng. 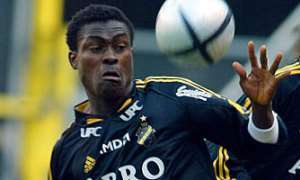 The Accra-born midfielder had a trial with Middlesbrough in the summer of 2003 before his move from Panathinaikos to AIK. Only last Sunday, one national newspaper speculated Middlesbrough might make a swoop for Boateng when the transfer window reopens in January. Argyle manager Bobby Williamson told Herald Sport: "He has got a decent pedigree and knows what the game is all about, but there are a lot of things to take into consideration when you are dealing with foreign players." Williamson may try to arrange a behind-closed-doors game for Boateng to play in next week. "He's under contract to his Swedish club and they are looking for a transfer fee, which will be negotiable if we decide he's a player we want to sign," said the Pilgrims boss. "In the meantime I'm trying to get as much information on him as I can. "I'm watching him in training and I'm trying to arrange a behind-closed-doors game next week to have a better look at him." The midfielder was recommended to Williamson by an agent he has dealt with regularly in the past. Boateng started his career in Ghana with Liberty Professionals but he moved to Greece in July 1999, aged only 19, when he signed for Kalamata. His form was so impressive that Panathinaikos splashed out £600,000 for Boateng in January 2001. Boateng then signed a three-year contract with AIK in July 2003 following his trial at Middlesbrough.